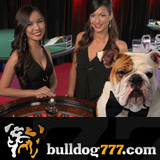 The Dog is pleased to welcome Makiko, Jin, Alexandra and Isabel to Bulldog777.com. These lovely ladies are dealers at the new Live Dealer tables now available at his favourite online casino, Bulldog777.com. Microgaming’s new Diamond Edition live dealer games feature higher definition video and real time depiction of all player bet action. Bulldog777.com has added 5 live dealer casino games – Roulette, Multi Player Roulette, Multi Player Blackjack, Multi Player Baccarat and Dragon Bonus Baccarat. In addition to the finest live dealer games available, Bulldog777.com also has dozens of slots games – including the new The Dark Knight online slot – and a wide selection of table games. Bulldog777 players can also use their integrated wallet in its poker room (on the recently upgraded Merge poker network) or in the sportsbook to bet on over 4000 live in-game betting events every month. Bulldog777.com offers personalized support 24/7 in English, Russian and Spanish.